Track maintenance is an essential and never-ending chore for the railroads. 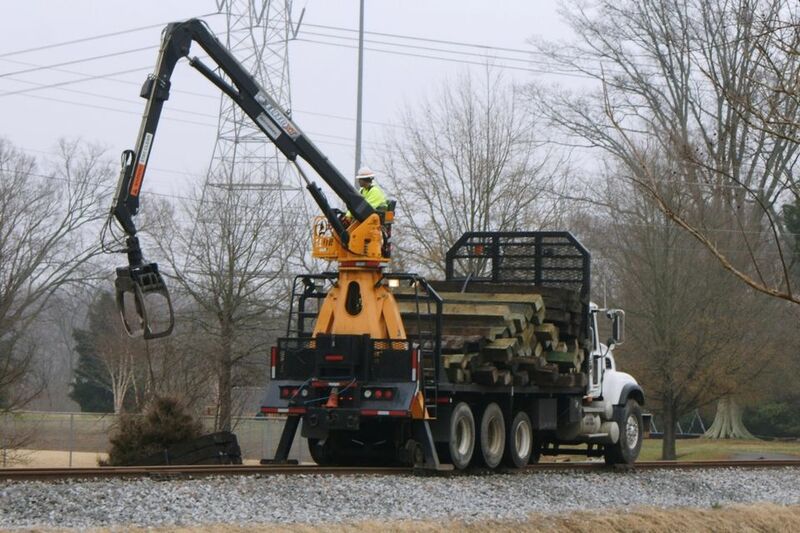 One of the most common tasks is replacing the wooden railroad ties which maintain the gauge of the track and support the weight of the train. Let's take a look at one of these modern teams and the work they do step by step. This will help you better understand these unique machines and how to replicate such an operation on your own railroad. All of the action seen here took place along the same stretch of track on the same day. Prior to the work day, however, gondola loads of new ties would need to be staged near the work. Much of the equipment seen here will arrive by flatcar as well. We begin our look with a hi-rail truck dropping bundles of new ties along the side of the right of way. Although this truck was just a few yards ahead of the crew, sometimes this is done days or even weeks ahead of the actual work. After the bundles of ties have been laid along the right of way, smaller cranes begin placing them for installation. Ties ready for replacement will be marked with bright yellow or orange spray paint for easy identification. These cranes will place individual ties perpendicular to the rails near the soon-to-be-removed ties. Each crane tows a pair of carts so that excess ties can be picked up, or additional ties put down if the initial drops weren't adequate. In most of the steps shown in these gangs, more than one similar piece of equipment was used in the line to speed the process. A cadre of spike pulling machines follows the cranes. Each of these little self-propelled cars pulls the spikes from the ties. Using four machines, each operator can focus on the inside or outside of just one rail. Tie plates beneath the rail will be pulled by hand after the ties are removed. This next piece of equipment is an interesting device. The large rotating drums are magnetized. As the vehicle moves along, the spikes, tie clips and any other ferrous debris are picked up and then tossed into bins on the back. The material won't be reused but can be recycled. Finally, the ties themselves can be removed. This machine slides the old ties out from under the rails. New ties can then be put in their place. Since the tie replacement makes quite a mess of the ballast, a ballast regulator follows the tie machine to clear stones from the tops of the ties. This is a quick pass to make sure stone won't get in the way in the following steps. A more thorough grooming will come later. This little buggy lifts the rails so a worker can slide new tie plates underneath. The operator walks alongside the machine and controls its motion with a tethered remote control. Next spikes are driven into the new plates and ties holding everything together. Two operators sit at the spike hammers. A third loads spikes into the trays that feed them. It's very much like pneumatic nail gun—only on a much larger scale! Another set of tie cranes comes next. These cranes simply make sure that all the old ties are far enough away from the right of way that the ballast crews can safely do their work. Another crew will be by later (often days or weeks later) to pick up all the old ties. 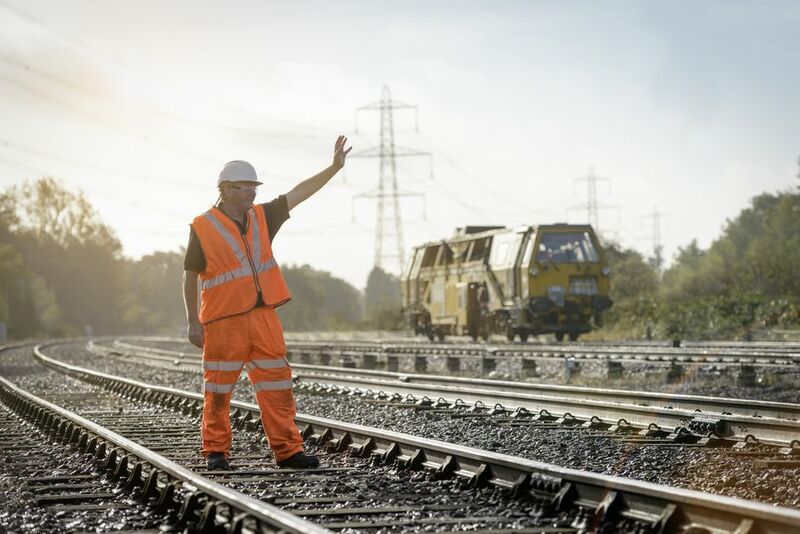 To level and align the track and ensure that the ballast is packed properly between and below the new ties, a series of tamping machines comes along next. These machines have small fingers which help push the ballast into place. They can also lift the track if necessary. Lasers are used to keep everything in line. Next, more ballast regulators will come along to groom the ballast to a proper profile much the way we do with a brush when ballasting model track. Another gang will be along later to clear all the old ties from the side of the tracks and load them into gondolas for reuse or recycle. When the work is done, the equipment is loaded back onto flat cars and taken to the next site. The car at the end of this train as a ramp which unfolds to get equipment on and off the rails. Towards the front of the train, white camp cars can be seen which provide housing, dining and recreation quarters for the track gang. Crews do not ride the train to the destination, however. Even if you don't model the operation at work, track equipment can make an eye-catching open load for those who enjoy a challenging modeling project. You could also randomly block off sections of track for "work" during your operating sessions to simulate the process and provide a new challenge for your dispatchers.